Mouse anti Human CD13 antibody, clone B-P6 recognizes human interleukin-13 (IL-13), a 12.5 kDa immunoregulatory cytokine produced primarily by activated T helper type 2 (Th2) cells, and also by mast cells and NK cells. 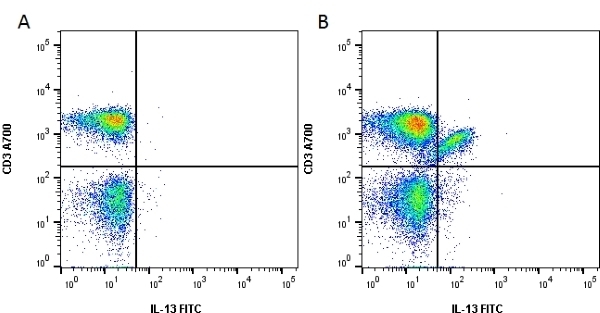 IL-13 induces the stimulation of B cell proliferation, antibody production and plays an important role in the induction of the pathophysiological features of allergic asthma, independently of Immunoglobulin E (IgE) and eosinophils (Wills-Karp et al. 1998). This product is photosensitive and should be protected from light. Avoid repeated freezing and thawing as this may denature the antibody. Should this product contain a precipitate we recommend microcentrifugation before use. Wills-Karp, M. et al. (1998) Interleukin-13: central mediator of allergic asthma.